Your bus, minibus or coach driver will pick you up at the desired meeting point and take you to the Swarovski Crystal World museum. When starting the sightseeing tour in Innsbruck, it is possible to plan a short sightseeing break in the beautiful city of Hall in Tirol on our way to the Swarovski Crystal World museum. When starting from Kufstein or other places to the north we can visit the silver mining city of Schwaz before reaching Wattens. 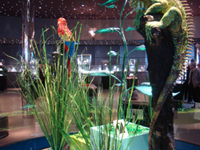 After our arrival at the Swarovski Crystal World museum, your driver or driverguide will take you to the entrance and give you time to experience the Swarovski Crystal World museum on your own and gather impressions through all five senses. Finally, you will have some free time for shopping and taking souvenir pictures before travelling back to the starting location of your sightseeing tour.